Last month Denise wrote a bit about her routine for storing local produce for winter in our Albuquerque Journal column, and that got me thinking I should look into it a bit more. There are all sorts of reasons for me to learn food preservation techniques: lower food costs, more options in winter, the impending zombie apocalypse… However, I’m a bit of a lazy cook, and canning sort of blows my mind right now. I needed something simple to start. Enter: food dehydration. To learn more, I picked up a book at the Santa Fe Public Library called Preserving Food without Freezing or Canning. A collection of submissions from modern gardeners who’ve modified family traditions, the book has a romance to it akin to your great-grandparents’ stories about churning butter in the good old days but contains simple, resourceful ideas that work in New Mexico right now. The best part: no expensive electric dehydrators. You can make an easy drying tray just by repurposing a clean window screen or nailing four sturdy boards together and stapling in a sheet of galvanized metal or plastic mesh. There’s also a tray-free method included in the instructions below, but if you REALLY want to spend money, you can get a hanging dryer net for about 30 bucks. Check the weather! Your produce won’t dry if it’s raining or snowing outside. 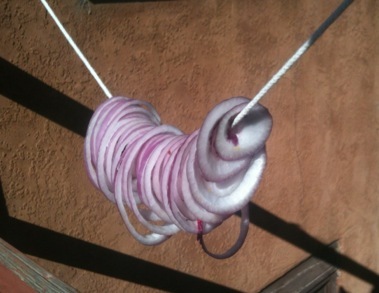 Case in point: I was experimenting with string-drying those onions you see in the above photo and found them soaked by the night’s rain. Cover your produce with a thin cloth to protect from flies and other nasties. Turn the produce 1-2 times a day if drying on trays. It’s not required per se but will give you a more consistent product. Bring your produce in at night or keep it very high off the ground to protect from moisture. Also not always necessary here in NM (unless, of course, there’s a storm passing through. See tip #1). Store dried fruits and vegetables in glass jars, cloth bags, or tins if you like it old school. Make sure your jars are completely dry to prevent mold. To rehydrate most dried foods, pour boiling water over them and let them soak for a few hours. Apples: In case you’re one of the lucky few that actually did see a small crop at your farmers’ market, snap them up and string-dry them. Just peel, core and slice the apples into thin rounds (no more than a quarter inch thick). Thread them onto sturdy cotton string and hang them above a radiator, covered with a thin cloth. No radiator? You can also dry them outside, above a stovetop or in the oven on the lowest setting with the door cracked. I’ve heard of spraying lemon juice on the slices for protection against mold, but there’s low risk of that here. They are done when leathery but still flexible (3-4 days). Eat them as is or rehydrate for pie filling or baked goods. Onions: Same deal. Remove the skins, slice the onions, thread on a string or place in a single layer on a drying tray, cover and place in the sun. Remove when the onions have shriveled and are fairly brittle. Onions don’t rehydrate well, so throw them in soups or 70s-era casseroles for best results. Spinach or Beet Leaves: Place on trays in a single layer (remove the ribs), place in full sun, and remove when the leaves are crisp. Boil in 1.5 quarts water for each ounce dried leaves, then season and eat or toss in soups, stir-fries or pasta at the very end of cooking. Peppers: This method works for hot peppers, sweet peppers, bell peppers, or any other kind of pepper. Remove the seeds, cut the flesh into one-inch strips and put them on your tray. Cover the trays with a thin cloth and place in full sun. The peppers will shrink A LOT and are ready when quite dry and brittle. No need to rehydrate when using — just throw these in soups. Tomatoes: Tomatoes are juicy, so they take the longest. If you can, choose a meaty variety without many seeds (I just saw some striped Roma at a farm in Taos; those would do well). Slice the tomatoes, remove seeds, cover in coarse salt, place on trays, cover and set outside. Turn the tomatoes once a day and bring inside at night. Remove the salt after a few days and finish drying. You can jar these as is or soak them in vinegar for 20 minutes then place in a jar of olive oil with herbs. You can eat these as is or toss into any recipe that calls for sun-dried tomatoes. Seriously, they go on everything. Herbs: Herbs should NOT be dried in the sun. Just find a dark, dry place in your house, tie the stems into bouquets and hang upside down until dry. I keep the bouquets as they are because they’re pretty, but you can also strip and grind the leaves with a mortar and pestle or crumble them with your fingers. There you’ve got a couple of easy starters. I’m experimenting with some of these now and will check in with updates as I perfect the techniques. Until then, check out Preserving Food without Freezing or Canning, start your winter hoarding at the season’s last markets and join me in learning the ways of the year-round local kitchen.